You may receive updates from 350 Auckland, the sponsor of this petition. We urge Auckland War Memorial Museum to take a strong moral stand for the public good and reject financial and non-financial support from Stevenson Group and its associated Stevenson Foundation, and fossil fuel companies like them with business plans that would drive climate change into an uninhabitable world. Stevenson Group operate the Rotowaro coal mine west of Huntly, and are trying hard to get the necessary permissions to build another open cast coal mine in Te Kuha on the West Coast. We must keep coal, oil and gas in the ground to have a chance of a safe climate future. The Museum is kaitiaki of 4.5 million treasures. As Aucklanders, it's our museum. We send the next generation there to learn about where we live, and a key challenge for this generation is climate change. We are proud that the Museum boasts one of the largest solar panel installations in the country and has cut its carbon footprint in half since 2010. It's time for the Museum to pledge to cut ties for good with its partners and sponsors like Stevenson Group, whose business models send their carbon emissions in precisely the opposite direction. We call on you to immediately put in place a policy to terminate all partnerships and sponsorships with companies, and any of their associated charitable entities, whose business is the extraction, exploration or production of fossil fuels within two years, and to reject any such future partnerships or sponsorships. It is important to us that Auckland is a leader in a fast and just transition away from fossil fuels and towards 100% renewable energy. We know that an important part of this transition relies on removing the social licence of the fossil fuel industry to continue operating under a business model that puts profit before the planet. Institutions can play a vital role in sending the industry a clear message by breaking their partnership and sponsorship ties with fossil fuel companies. Stevenson Group’s Rotowaro coal mining operations release dangerous and unsustainable amounts of carbon dioxide into the atmosphere. Additionally, Stevenson’s proposed open cast coal mine in Te Kuha, Westport, threatens the survival of many native New Zealand animals, including the Great Spotted Kiwi, West Coast Green Gecko, and Forest Ringlet Butterfly. We urge our museum to honour its role as kaitiaki and break its ties with Stevenson Group. Last year, Auckland Council made history when they decided to completely divest from fossil fuel companies, including coal, oil, and gas. The Council showed leadership by taking a moral stand, ensuring that ratepayer funds would not be used to support unethical, socially irresponsible companies. 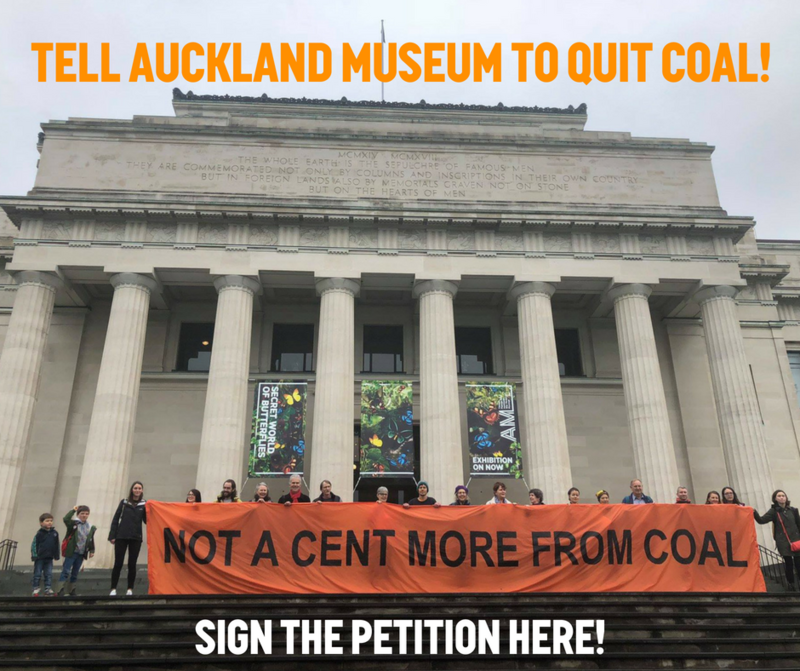 Now, we call on you, as the Board of Trustees for Auckland Museum, to take this same moral stand, by choosing to disassociate the Museum from the fossil fuel industry, as outlined above.